I posted on oca last year but I gave a talk at the Tramore GIY group (Grow it Yourself) last week and I was asked about the crop. There was so much interest that I promised I would send some tubers to their members. 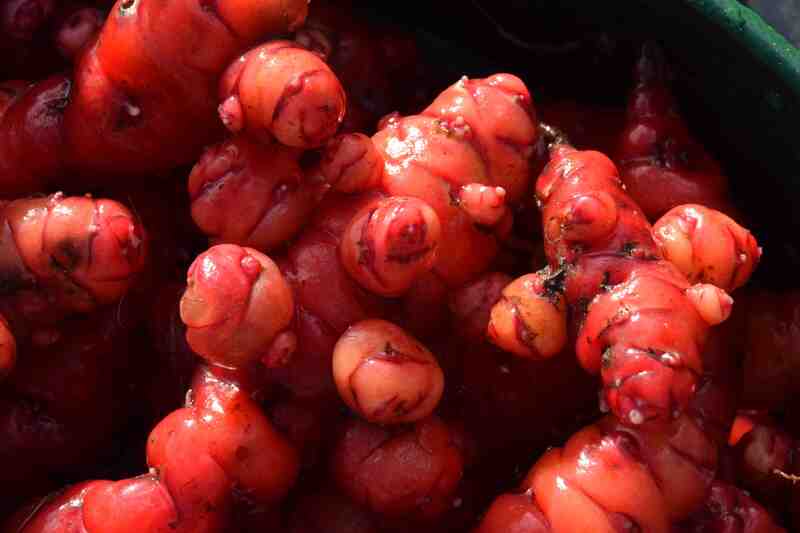 Last year (well the 2013 planting) I had my best-ever crop of oca but it still wasn’t great. It was just that in previous years I didn’t get much more than I had planted. But I made a bit more effort last year (2014). As usual I started the tubers in pots, one per 9cm pot, planting them in March and put out the plants in the garden in late May. 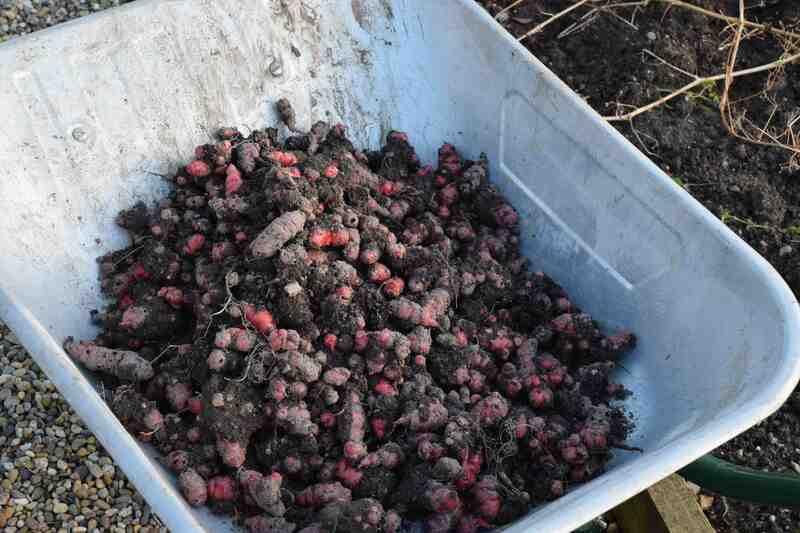 Oca (Oxalis tuberosa), sometimes called New Zealand yam (for no reason other than it is grown a fair bit in that country) is an easy crop to grow, once you get some stock, and doesn’t get any pests or diseases. The biggest problem is that the tubers do not form until about November and it is essential, in most areas of the UK, that the plants are fleeced or grown in a poly tunnel to get a crop so the plants are not frosted before the tubers swell. In Ireland, especially in the southwest, that should be less of a problem. Anyway, lifting the tubers was a job that kept getting left and left until this week (the promise of that parcel to Tramore spurred me on). I know I should be ashamed of myself because the beds should be dug by now. Anyway, I lifted the dead plants and carefully went through the soil to get at the tubers. There were about 30 plants in total, planted at about 60cm spacing – the plants get quite big by late summer and their dense, sprawling growth suppresses weeds. The result was the haul in the barrow above. This all sounds good so far but there are a couple of other problems with oca. The tubers can be small (or larger) and oddly shaped – in fact they look a bit like giant grubs. It is impossible, and unnecessary, to peel them but they do need washing. Because they are irregular in shape they are a real pain to clean, especially if they are grown in clay soil as these were. 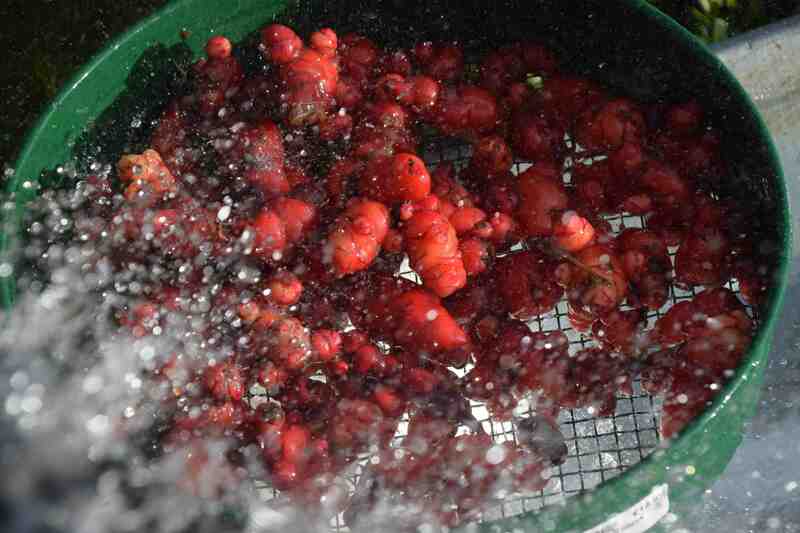 I filled the barrow with water and washed them as best I could and then I put a couple of handfuls at a time in a sieve and blasted them with a jet from the hose. By this stage they were almost completely clean and certainly ready for the kitchen. But it did illuminate another problem! Although I said that oca is pest free, that is not entirely true because slugs, especially those tiny black keel slugs, are a real pain and I would say that only about 10% of the tubers were free from damage. Now that is partly my fault for leaving them in the soil for too long but it is a problem. You could help avoid this if you watered the soil, in the growing season, with nematodes to control slugs (Nemaslug in the UK). Of the rest, about half my crop is probably too damaged to be eaten, though they are OK for replanting, and the rest can be carefully cut to save the edible bits. I think I have learnt that it would be far better to grow these in humus-rich soil and I am going to try some in bags of compost and in raised beds with multipurpose compost this year. They would be fine for a pot on a patio because the plants are nice enough to look at. Growing in pots of compost should ensure not only a good crop (you could bring the pot into a greenhouse in late autumn) but clean tubers. So what do you do with them once you have grown them? Well they can be roasted, boiled, microwaved or steamed and they taste rather like potatoes. Be careful with cooking times because I think they are best eating when they are only just cooked and retain a bit of ‘bite’. They cook more quickly than potatoes but then they are much smaller. I suppose it would be most appropriate to make some sort of stew mixing them with sweet corn, beans and squash to reflect their Andean origin. I have to admit that they are not a taste sensation but are fine to eat. They are edible raw too and are supposed to have a citrus taste but I think they are a bit too starchy to really enjoy. They are pleasantly crisp though and do have an oxalic acid twang. However, it is recommended that the tubers are exposed to sunlight after harvest to encourage the starch in the tubers to convert to sugar. We don’t get a lot of sun in December but I am leaving some of this harvest to get any sun we have in February to see if it makes any difference. What a strange looking crop! I can’t quite decide what they look like – grubs, as you say, – bacon wrapped sausages also crossed my mind! Do you find they’re widely grown? The sooner that you wash them after harvest, the easier it is. Once any of the soil has dried to the tuber, it becomes a lot harder. Fresh from the ground, it usually just takes a quick spray with the garden hose.